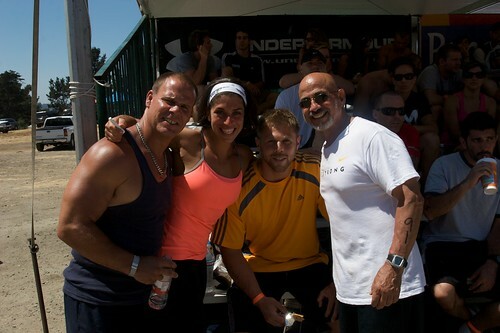 CrossFit Suffolk was graced yesterday, once again, with the presence of Gillian and husband, Mike. Gillian did "The Bear" for the first time and completed it with 95 pounds! Lee finished The Bear with 75 pounds and Janie did the workout with 33 pounds. Janie wanted to go up in weight, but we wouldn't let her! The Bear for those of you you haven't seen it or don't know what it is can view it here, courtesy of CrossFit.com: Bear Complex WOD…[wmv][mov]. Gillian can often be found helping out at the CrossFit Gymnastics certifications. She gave a muscle up "clinic" after the workout.